We are very fortunate on the Sunshine Coast to have some wonderful swimming lakes. They are clean and warm up nicely during the summer. In my opinion, they can’t be beat! I’ve been enjoying Ruby Lake since before I lived on the Sunshine Coast and it is one of my favourite swimming lakes. When I was around eight we started coming up to the Sunshine Coast for weekends and holidays and our destination was always Ruby. We stayed at the Ruby Lake Resort a few times and also rented holiday cabins that were only accessible by water. As an older teen and twenty something I spent many a weekend rough camping up at Ruby with friends. I learned how to water ski here and it is also where I learned to drop a ski and slalom (not that I was ever very good, but it sure was fun!) I have so many great memories of this lake! 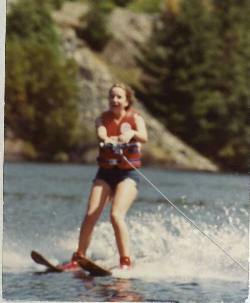 This is a photo of me water skiing waaay back in 1979.
are a couple of spots to get down to the water and there used to be a rope swing along there somewhere. The highway along the lake is narrow and windy so be careful. Just a note – if you stay at the Ruby Lake Resort you get the use of their private dock for swimming and also they have a couple canoes that can be used. If you feel adventurous there are lots of nice, secluded places on the lake you can paddle to. Across the highway from the entrance to Dan Bosch Park is a dirt road. If you follow this up the hill you will connect in with the Suncoaster Trail and you can go left to Klein Lake (another beautiful lake) or right over to the Iris Griffiths Centre. Sakinaw Lake is the largest of all the swimming lakes on the Sunshine Coast and is as beautiful as Ruby Lake, but unfortunately there are no public beach areas. There is a gravelly boat launch at the end of Sakinaw Lake Road, but because there is boat traffic in and out it isn’t the ideal spot for lounging. However after a long bike ride or hike, I love to come here for a quick dip and to throw a stick for the dogs. 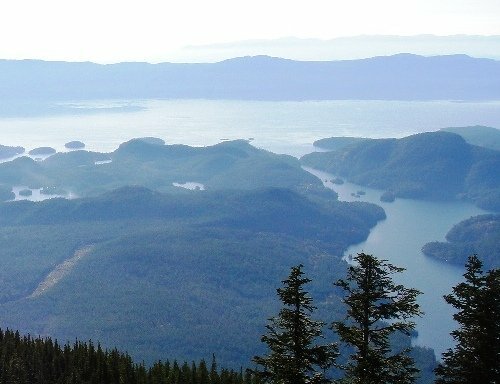 As you can see from the photo above, Sakinaw Lake on the right connects with the ocean and has a resident population of Sockeye Salmon. Motorized boating is also allowed on Sakinaw and along with Ruby they are really the only two lakes where you can water ski. The lake is a popular destination for kayaking and canoeing as well. Across the highway from Sakinaw Lake Road is the Suncoaster Trail. You can go left towards the Iris Griffiths Centre and Ruby Lake or right will take you towards Pender Harbour. Note: The next two lakes are in the Garden Bay area and are my personal favourites, but keep in mind there are two other great swimming lakes within just a few kilometres - Hotel Lake and Mixal Lake. If you have the time to explore, you can find some fantastic swimming spots! When my children were small we spent a lot of time at Katherine Lake. There is a great campsite here and a man made beach that is fun for the kids. There are also trees so you can get out of the sun if you need to. It is one of the best family swimming lakes on the Sunshine Coast. The lake is small and warms up quickly, but this means it tends to get pretty soupy by the beginning of August which is when I usually stop going. There’s also a trail along the west side of the lake and you can follow it and get away from the crowds if you wish. Access to the Katherine Lake is off Garden Bay Road. Garden Bay Lake is on the other side of the road from Katherine Lake and you can walk to it from the campsite. This is actually a nicer lake than Katherine, but doesn’t have the beach area for small children. Once the kids are a little older though, this is a great place to come because although it warms up nicely it is a larger lake and never gets that soupy feeling that Katherine Lake gets. The water here is crystal clear! Garden Bay Lake is the water source for the area so there are no motorized boats allowed and it is also asked that people do not wear sunscreens if swimming in the lake. There are a couple of great hikes nearby – Mt. Daniel which is just back along the road a short ways and Pender Hill. For more information on these and other trails in the Pender Harbour area check out the website. I just recently discovered McNeill Lake when I was checking out the trails around Middlepoint and gpsing them for my websitet. I can’t believe that I had never heard of it before because it is a really pretty lake and right up there with the best swimming lakes on the Sunshine Coast. The thing I really like about it is that not many people come here. Last summer I went up six or seven times and only ran into other people once. You can access the lake from Menacher Road in Madeira Park. This is the easiest and most accessible road for cars. There are pot holes, but it is driveable. Take Menacher Road off Hwy. 101 and follow it about 6 or 7 kms. You will pass several branch roads on the left and I think only one on the right. Stick to the main road and when you come to a place where it forks (after about 5 kms), keep right. The road dead ends a few kilometres along, but before the end of the road and just before the trail Dry Feet you will see a grassy path on the left. The lake is about 5 minutes down this path. You can check out my map of the area here and you can get a better idea of the roads and trails. There are many hiking and biking trails in this area and Menacher Road itself is part of the Suncoaster Trail. 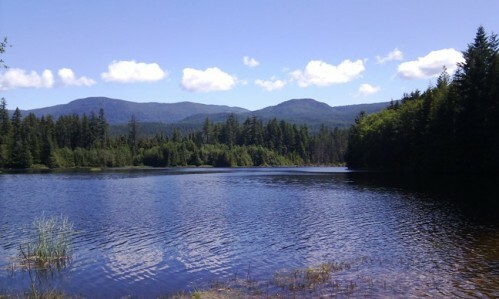 Trout Lake is about a 10 minute drive northwest from Sechelt; right on Hwy. 101 in Halfmoon Bay. 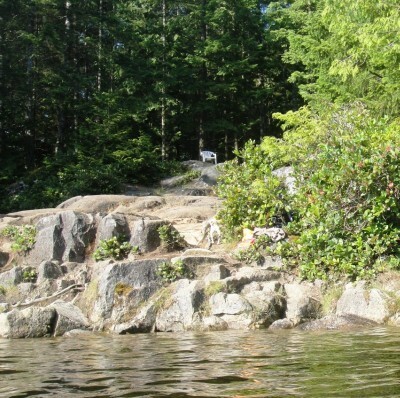 It is one of the most popular swimming lakes during the summer because of its close proximity to Halfmoon Bay and Sechelt. There is no beach here, but rather lake access is off large rocks along the shoreline. Because of this it isn’t a good lake for small children. There is no shallow end and this lake is very, very deep. When my kids were young I would bring them up here and make them wear a life jacket for my peace of mind. The water here is not crystal clear. Instead it has a brown colour to it. This is just caused by the peat and minerals in the water. The lake used to be the water source for Halfmoon Bay until about 10 years ago. It’s lovely and clean and warms up nice during the summer, but some people find the brown colour disturbing. Safest access to Trout Lake is to take Hwy. 101 to the first Trout Lake Road (second if you are coming from the northwest). Take the road in on the right with the yellow gate and follow it up to parking area. There’s a short trail into the lake where you’ll find an outhouse and picnic area. This is a fun spot to jump in off the rocks and off the highway. There are many, many trails in Halfmoon Bay so it’s easy to combine a bike or hike with a swim on a hot day. 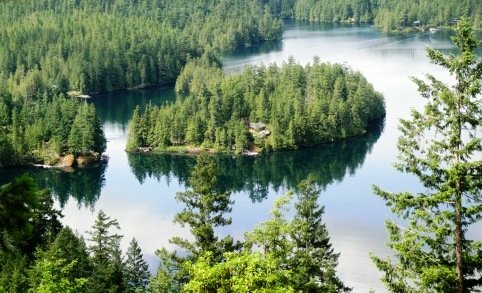 Click here to return from Swimming Lakes to the Sunshine Coast Trails Home Page.